As a new business owner (!!! ), one of the things that I've been researching is exactly how I want my new business to look and feel. To me, it's super important that my business name, logo, and aesthetic be something that I can be proud of. I want to feel confident in my name and look so that I feel confident to approach new clients and take them on without hesitation. 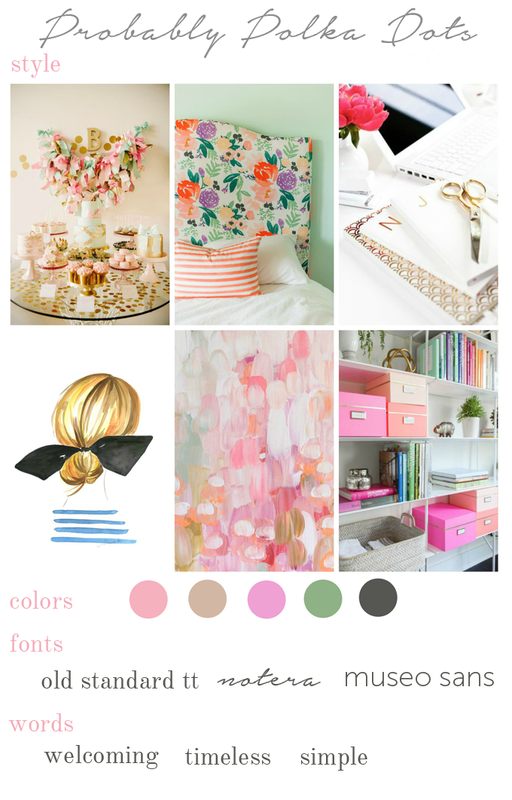 Of course Pinterest has been a huge help with designing my aesthetic. I've been pinning potential logos, colors, fonts, and even web designers for the past few weeks. One of the things that I keep thinking about over and over again is my new business cards. I currently have great business cards from Moo.com that have been perfect for me for my blog and writing gigs, but as I venture more into the business side of things, I want a design that is going to be specific to my new brand. I almost want my business cards to drive the rest of my site. I know it seems crazy to start that specific, but that's the one piece of new business collateral that I'm most looking forward to. I am in the process of deciding if I want to continue the same feel of Probably Polka Dots into the new brand, or if I want to start from scratch and later shift PPD in that direction, too. When I took Lauren Felix's Social Media with Style course last month, she challenged us to think about our blog design as an extension of ourselves. I definitely think that my current blog aesthetic showcases what I gravitate towards, but I can't help but to feel like something is missing, and I am looking forward to building a new concept that truly, without a doubt, completely represents me. Exciting stuff!